The interesting thing is that an equivalent computer with today’s technology could be about $2000 – so it would still be cheaper than the equivalent computer four years ago. Of course, if he were to go with SLI/Crossfire and an Intel Hexacore processor – then he’d probably be in the same price range if not surpassing it a bit. I mostly wrote this simply as a comparison point of what a difference four years makes in the price of technology. I’m not suggesting that people should wait too long because they you’re getting yourself into a place where you can’t upgrade. 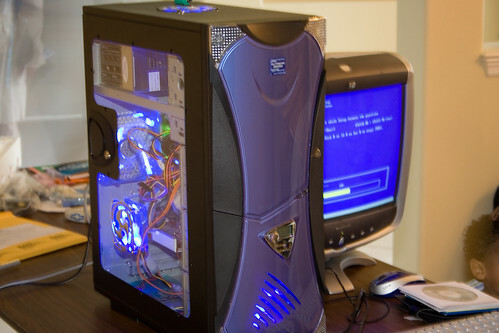 For example, for Dave’s computer he can’t go up to the next highest graphics card without replacing the motherboard. And at that point, with all the tech that’s come since then, he’s also be replacing the processor and RAM. But, it certainly gives hope that you can have today’s technology at an affordable price if you’re willing to wait a year or so. I remember when I used to covet that computer, haha.